Included free with every domain from POP, because we love you. Upgrade to Plus for even more love. A simple landing page, free for all POP users. Getting an idea off the ground is hard, getting a basic webpage up for it shouldn't be. With POP, every domain comes with a free Simple Page. With a few clicks, update the text, images, social profiles, and contact form on the page to have a simple, professional web page live on the web – letting your idea shine for the world to see! Choose from our preselected backgrounds or upload your own! Easily add content in predefined elements. 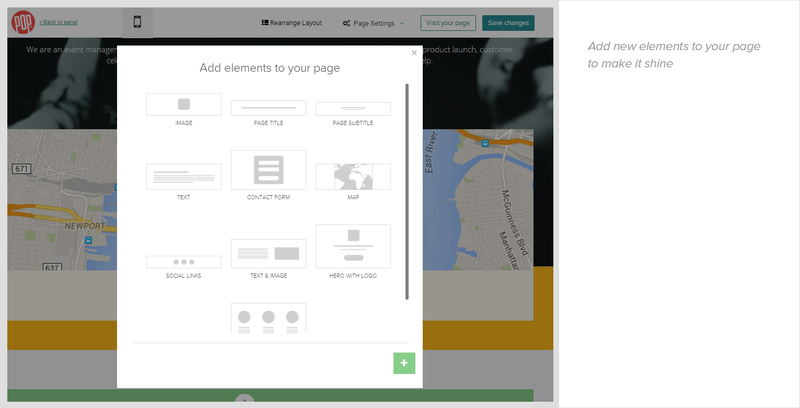 You've got everything you need to edit your content right inside the element. Align your content and add in background shading. Change the width of your content blocks, select the alignment, and modify the background transparency all in once place. Change your fonts from top to bottom. We put together font families for a great look and excellent readability for all content on your page. You're not stuck with just a few predefined elements--add maps, contact forms, text boxes, images, and more! Sometimes you just need to move what you have around for a fresh new look. Don't like what you see? Ditch it! You can delete any element you don't want any more. Can I add my own images to the Simple Page? Absolutely. We provide you with a series of images that you can choose from, or an easy image upload tool to use your own. The Simple Page is completely customizable with different font styles and colors as well! I have my own site, what if I don't want to use the Simple Page? If you want something more than the Simple Page, use our Simple DNS to point your domain to another service. You can access the Simple DNS here. Upgraded Simple Page with file upload and command line access! POP is the ridiculously easy way to launch your business or idea online.